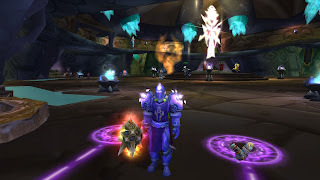 Chronicles of a Casual: Transmogapalooza! Greetings! It's been a few days since I've made a post and I wanted to check in real quick before bed with a couple of fun screenies and a brief update. Still on the fence with that cloak. I say the set is 90% finished because I don't plan on sticking with World Breaker. It's an appropriate weapon for a t5 tribute, but I feel the skin is a bit more warrior than it is paladin. 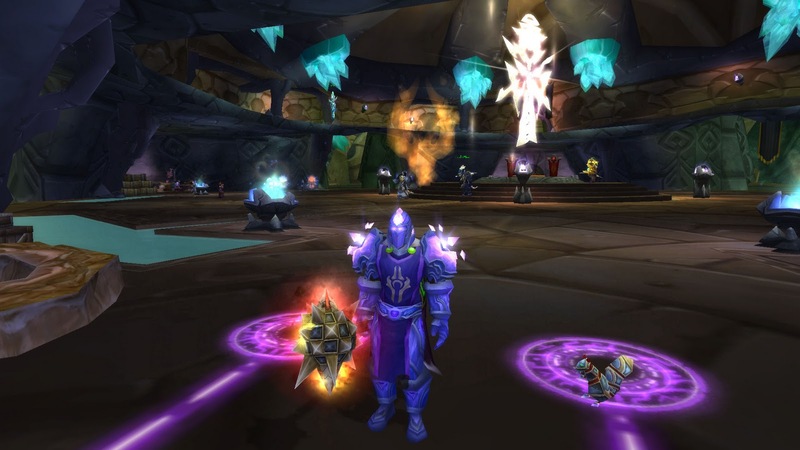 Hammer of the Naaru is my mace of choice for this Crystalforge t5 mog masterpiece. Sure, it's a lot of purple, but I just think the giant purple stone on the end of that mace flows perfectly with the look. The cloak pictured is off Illidan and I'm happy with it for the most part. Once I get my hammer and finalize the look, I may cycle through a few level 70 back pieces and pick my favorite. As you can see, I'm sporting an Aldor Tabard, which I managed to obtain in one night of farming. Big ups to my guildie Teska for helping me go from neutral to exalted in less than two hours. 71 Fel Armaments go a long way. A ridiculously long way. Going from neutral to 3/4 of the way through revered happened with zero farming. I did the rest by running through some quests in Netherstorm. The tabard is really the icing on the cake here. I think it really ties the set together. I'm very happy with the overall look. With a group, none of the above are hard to get. The belt is craftable, and the boots drop off of SSC trash (and thus are easily solo-farmable.) Getting an Aldor tab represents either a lot of farming, or some AH/guildie luck. Like I said, I'm super happy with how my set turned out. Happy enough to devote this ridiculous blog post to it. Tomorrow should bring an obligatory "stepping into DS and what's cool about patch 4.3" post, so stay tuned. 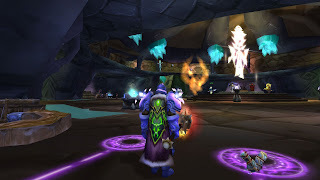 Cereal Killers took our maiden voyage into the new end-of-expansion raid this week and I've come back with a ton of thoughts on the content. First though, bed.